We're one week into our summer holidays here, and anxious to start on our summer crafts. However, my craft bucket was looking a little empty, so I hopped over to the Dollar Store and spent an embarrassing amount of money (for the Dollar Store, that is). This should keep up well stocked for the next little bit. Although I teach the older grades, there must be a little bit of Kindergarten teacher in me. I LOVE having theme days with my kids. My sister had posted a really cute craft on her blog, and I knew I wanted to try it with my kids. So, I set the mood for our day by playing a cute little snail song by Bryant Oden. After we sang it a few times, it was on to the craft. Unfortunately, I couldn't find my glue gun and the white glue just wasn't working, so it quickly became meltdown time. Luckily, I averted the major meltdown by reading a book (and sending my husband to the store to buy a new glue gun). 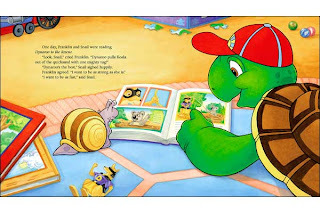 We must have thousands of kids books (literally), but I couldn't find a book about a snail! So I chose to read a Franklin book - Franklin's friend is snail - good enough! 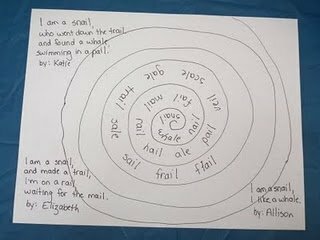 After our book, we came up with words that rhyme with snail, and then wrote and illustrated little poems about a snail. This was soooooo cute! They did such a great job! This is Katie's poem. She's my five year-old. She just finished junior kindergarten this year. And then it was time for lunch. My sister does these fabulous "Fun Food Fridays", and my kids beg to have "Fun Food Fridays" no matter what day it is. Sometimes, I oblige, and today was one of those days. This is our snail-themed "Fun Food Saturday". They LOVED it, and apparently I'm the BEST MOMMY EVER!!! (I thought about getting this in writing for those days when I'm the worst mommy ever). After lunch I broke out my brand new (cordless!!!) glue gun, and we finished the craft we started earlier. Aren't they the cutest little snails ever? I think they look great in the garden and I tried to convince my girls to let them stay there and act as "snail scarecrows", but I'm pretty sure they're destined to become Barbie's pets. What a fun day! But now I'm ready to relax, and hopefully, maybe, actually take it a snail's pace. Thanks! However, a little help getting stuff ready for the classroom sounds great to me, too! Fun! I have to say that Allison is quite the little artist. That's an excellent looking snail and way to go on her writing her letters. Maybe she could come give Kirsten a pep talk! Thanks, Jill. "Auntie Jilly" is our inspiration - keep those crafts coming! Jay and I were just talking about what a little artist Allison is - you should see the fairy she drew the other day! I love your snail themed lunch! Very cool- theme days are fun and that poem is amazing. I didn't know there were such things as cordless glue guns! Thanks, everyone. Allie, I had no idea there was either. It only works cordless for 5 minutes at a time, but I'll take what I can get. I had a super fun day with the kids, and I'm planning our next theme day ... stay tuned. How cute is this!!! I cant wait to have kids so I can have theme food!! I dont think my husband would go for it... :) What a great mom you are!